I love St. Maarten for many reasons– one of them is that “France” is right next door! We get the language, the culture, and the food– oh, and is the food delicious! 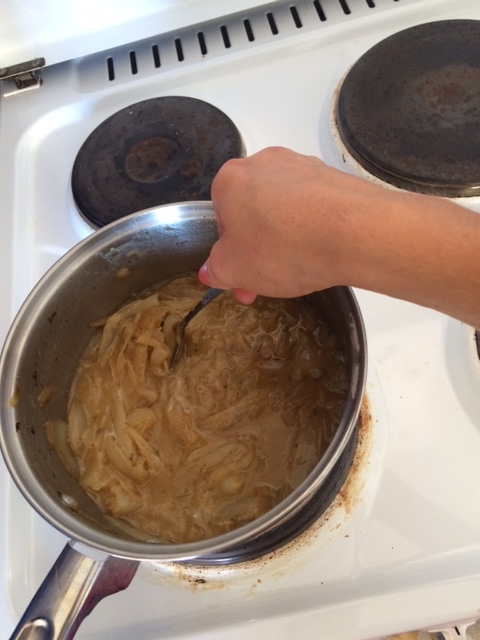 Of course, you can’t have French food without French onion soup, so I decided to make some at home. 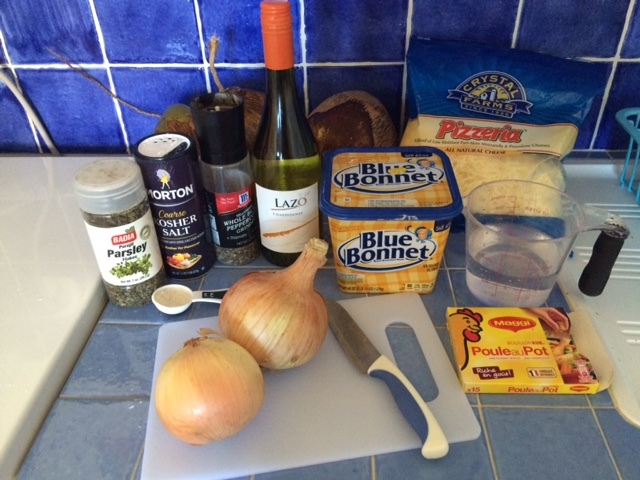 This is my budget version of French onion soup. Step one: Slice onions thinly, top to bottom. If you need to have a good cry, this is a great time to do it. 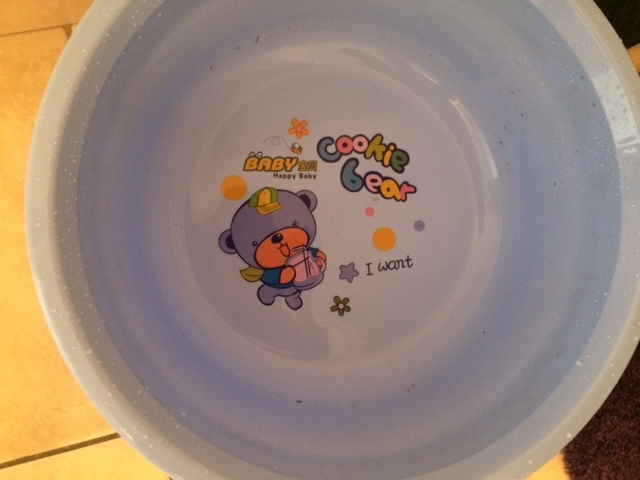 You’ll be weeping buckets by the end of this step anyway. Step 2: Melt butter in a pan, add herbs, and stir in onions. 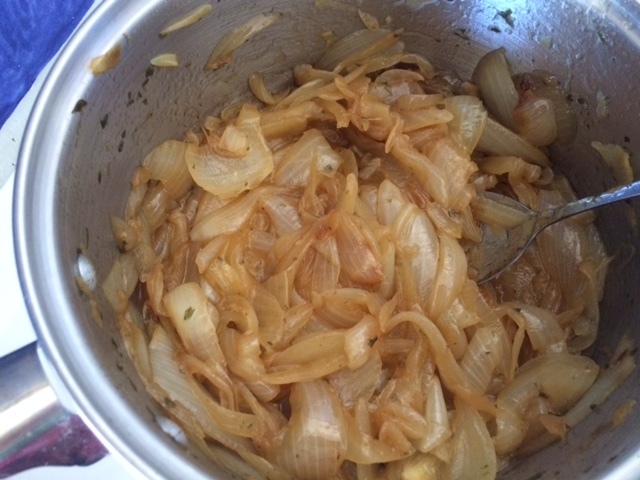 Step 3: Stir onions frequently until they are a deep golden brown. 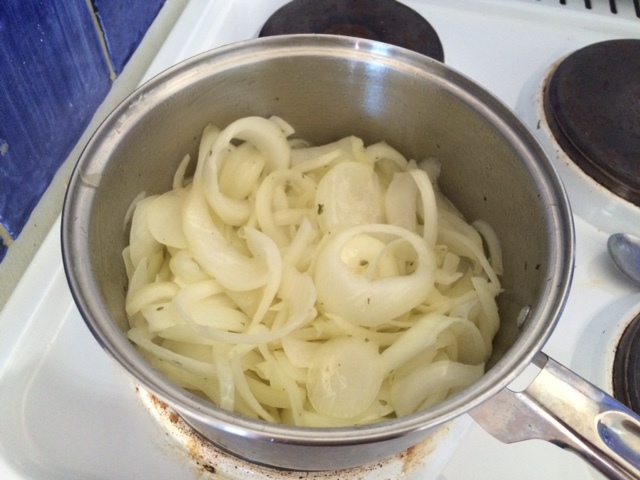 Optional Step: Become distracted and forget to stir the onions. Burn the bottom layer, scoop the rest into a new pan, and do your best to remove the smell of burned onions from your home. Step 4: Add flour and stir. Step 5: Add wine and stir. I have no idea what kind of wine is best for this, but I chose Lazo Chardonnay because it was cheap and I liked the shape of the bottle. 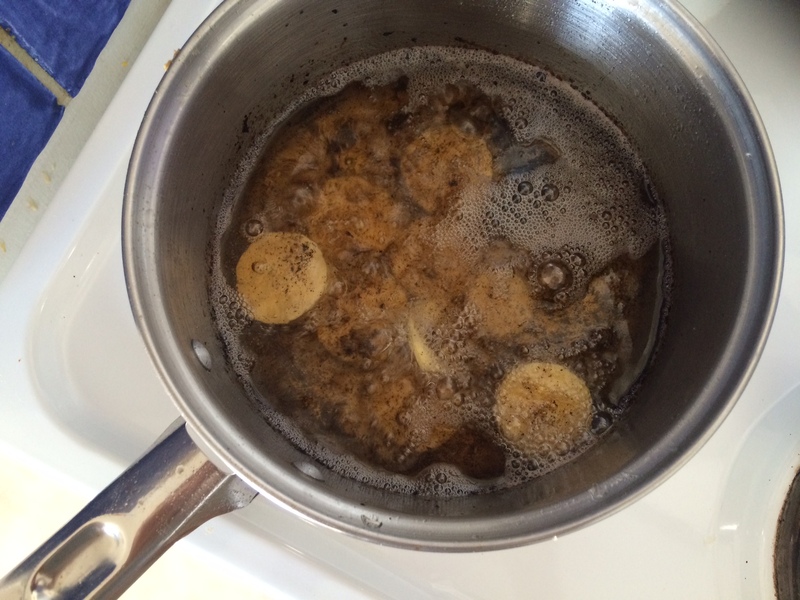 Step 6: Add 4 cups of broth, the water, and half a teaspoon of pepper. Turn down to simmer for half an hour and stir occasionally. 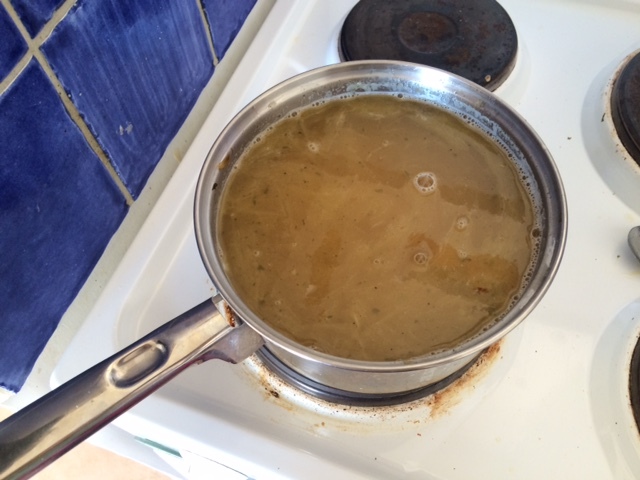 Preheat the oven to about 100* C. All you need the oven to do is melt the cheese on top of the soup. 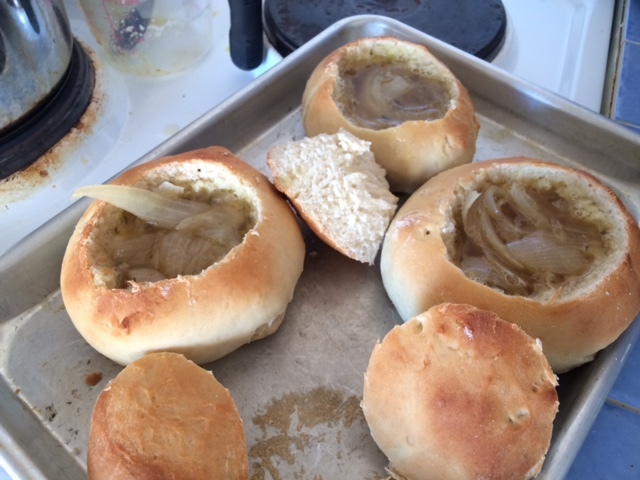 Step seven: Pour soup into bread bowls. 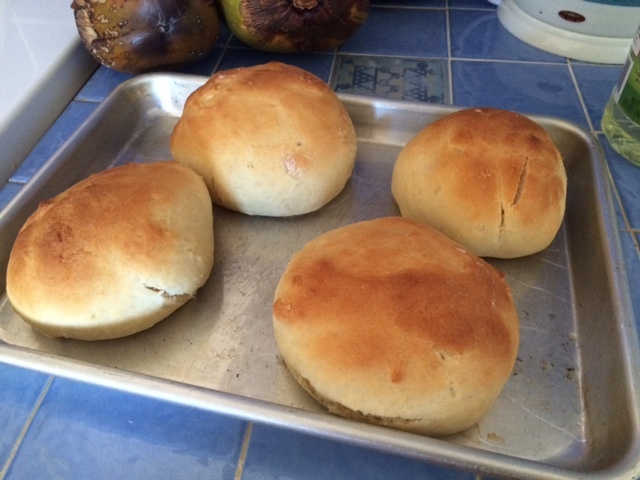 I baked my own bread bowls from scratch. Because I have that kind of time in my life right now. If you have kids, a regular job, school, whatever, by all means save yourself some sanity and buy them from the store. Step 8: Generously sprinkle cheese on the soup. I bought a mozzarella and provolone mix, but to be authentic and fancy, you should use Gruyere and Parmigiano-Reggiano. 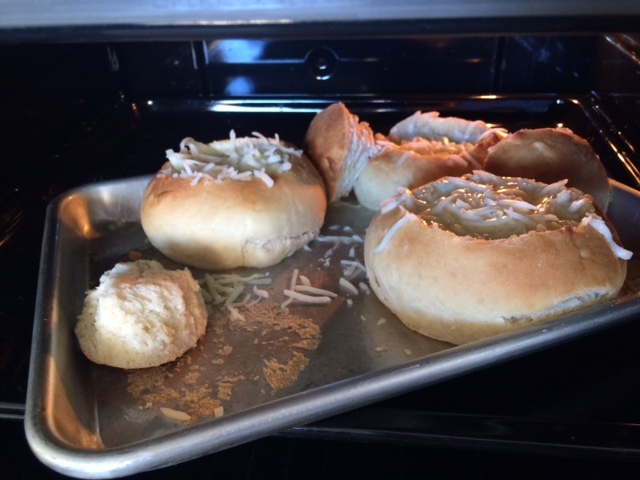 Step 9: Put the soup in the oven until the cheese melts. Or don’t. 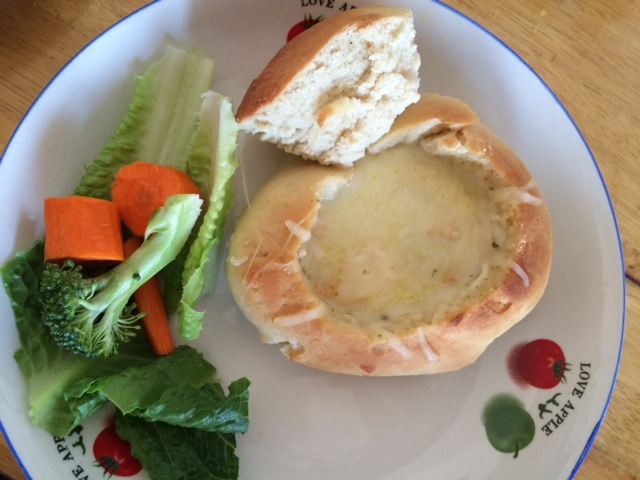 I put the soup and bowls in the oven to get that melty-cheese deliciousness, but it might be better to do this when the soup is served in actual bowls. 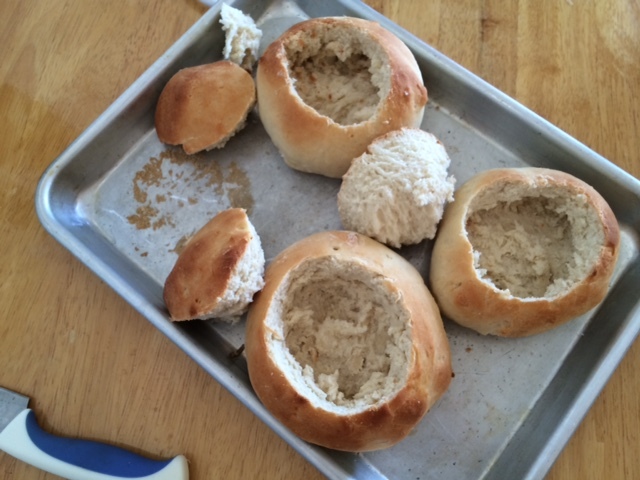 Leaving the soup in the bread bowls so long before serving made them a little soggy. But if you like that, go for it! Step 10: Serve and enjoy. Yum! When we first moved to Sint Maarten, I was expecting to be forced to go without some of the things that I’ve always been used to having. Not the case. In fact, not only do the stores here carry virtually everything you could possibly need, they also carry some things you could never, ever possibly need in a million years. For your entertainment, I have compiled a stack of photos from the Ace Home Store. 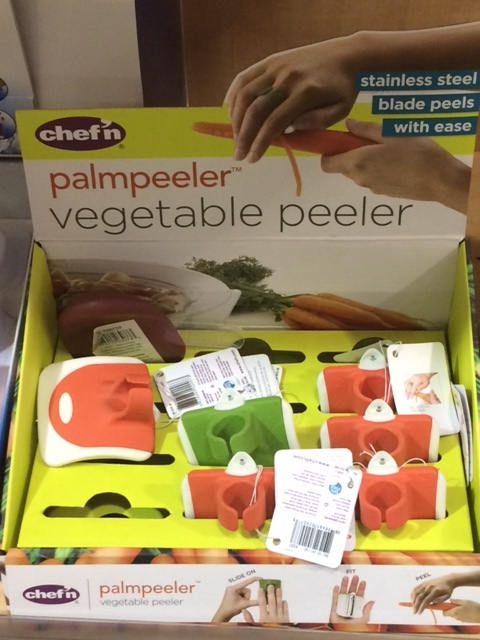 First is the Palmpeeler. Basically, it’s a ring with a carrot peeler on the inside. This in the answer to one of the great questions of life: What would Larry the Cucumber buy his girlfriend for an engagement ring? The Garlic Keeper! For only $5.95 (plus tax! 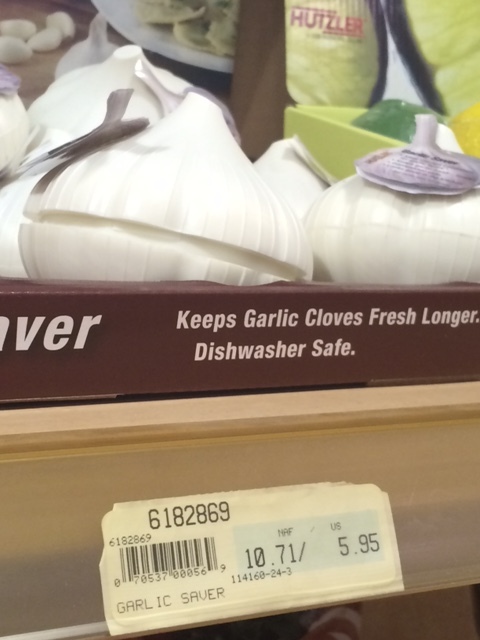 ), you can keep garlic clove halves fresh. It will only take a few years for this thing to pay for itself. The Easy Twist! Works on pretty much every jar anywhere, and you’ll never have to ask your husband to open a jar of pickles again. Of course, you could just get one of those circular grippy things (or a kitchen towel), but why save kitchen drawer space when you could have a cool new toy? 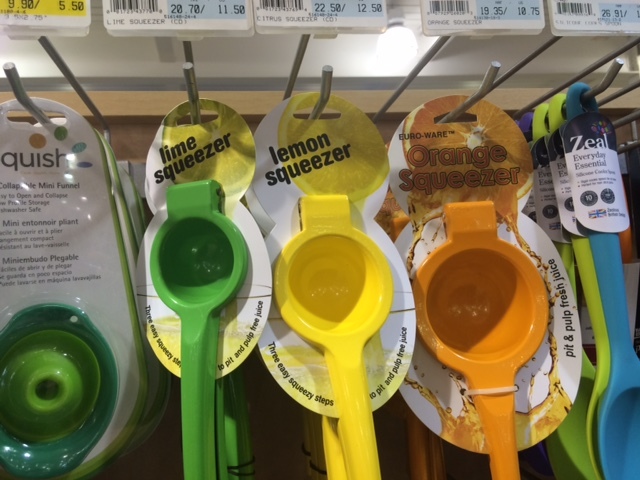 A lime squeezer, a lemon squeezer, and an orange squeezer. 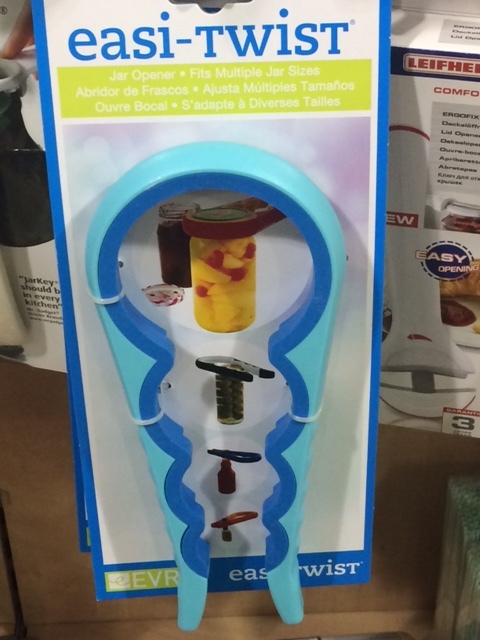 I get the need for an orange squeezer, I get the need for a lemon squeezer, but I don’t get why you’d need both a lemon squeezer and a lime squeezer. Just to have all three colors? And how often do you really use lime juice in cooking, anyway? Because we wouldn’t want to lose our silverware, now would we? 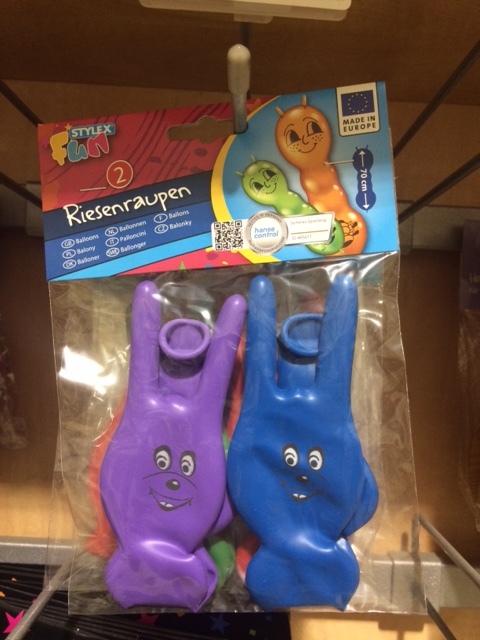 Here’s what every kid wants at her birthday party: two creepy centipede balloons with bunny ears. 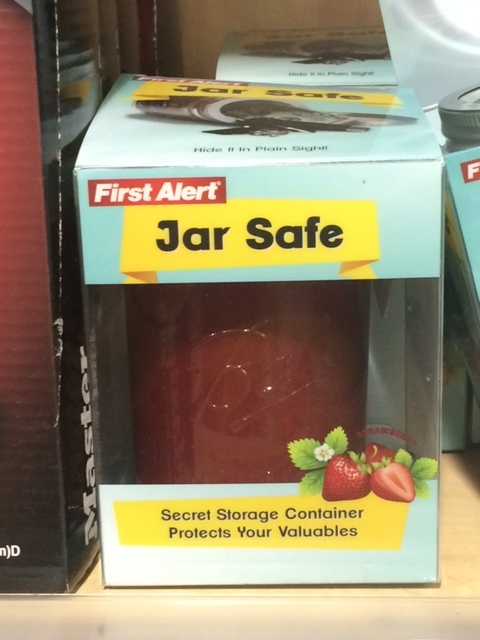 The jar safe! It’s an empty jar with the inside painted to look like it contains fresh strawberry preserves. 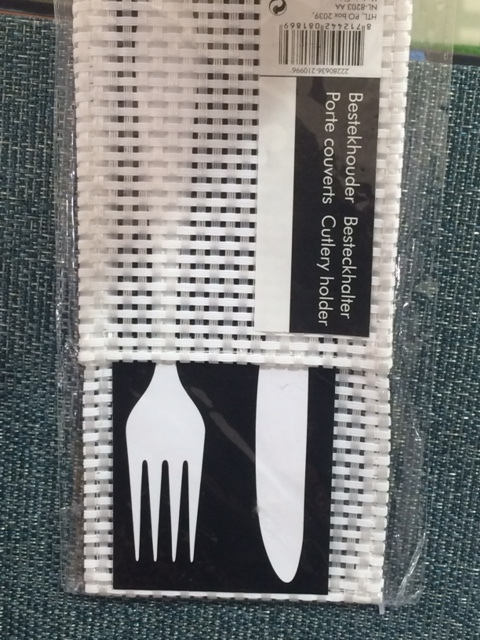 This is a great idea, but it should probably be a Pinterest pin, not a twenty-dollar retail product. 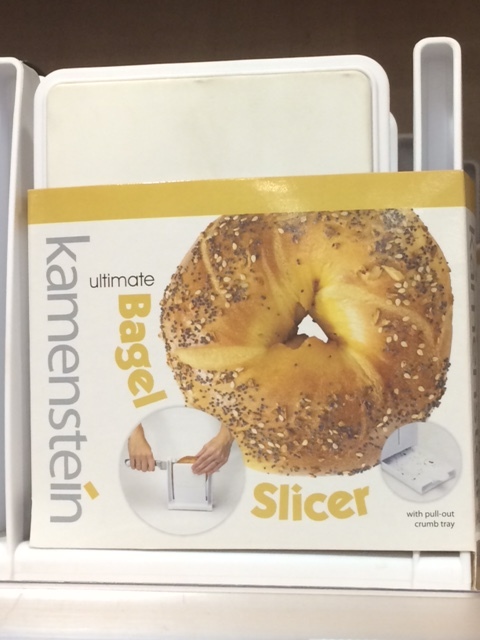 Bagel slicer. Because knives are super hard to handle. That’s all, folks! Tune in next time for Chinese-English mis-translations on plastic imports, brought to you by the Asian market next door. After my last post, A Typical Day at American University of the Caribbean, I was encouraged to tell about my own typical day. This is a little harder than sharing a typical day for Ben, mostly because my days are never the same! We woke up at 6:30, a little later than usual, because we had a late-night Skype call the night before. I made stove-top toast for breakfast, and Ben left for class at 7:20. I organized my laundry and took it to AUC’s dormitory laundry room. Our apartment’s washer and dryer don’t work well, so I always do laundry at school. One of the washers had leaked, so an AUC employee was mopping the floor. I stopped to chat with her for a while. 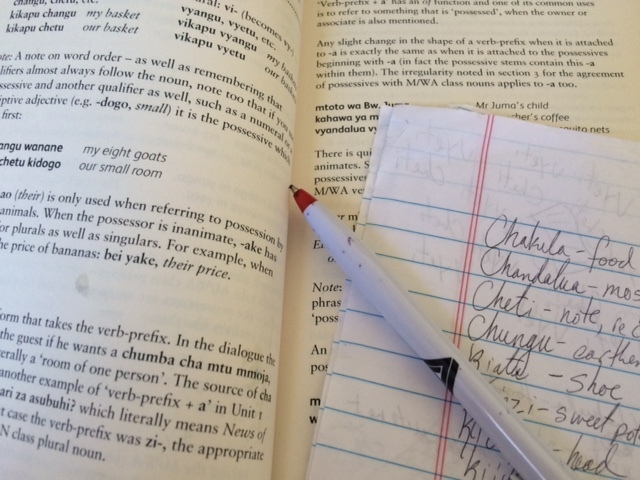 While waiting for my laundry, I studied Swahili from a textbook I got a couple years ago in Kenya. 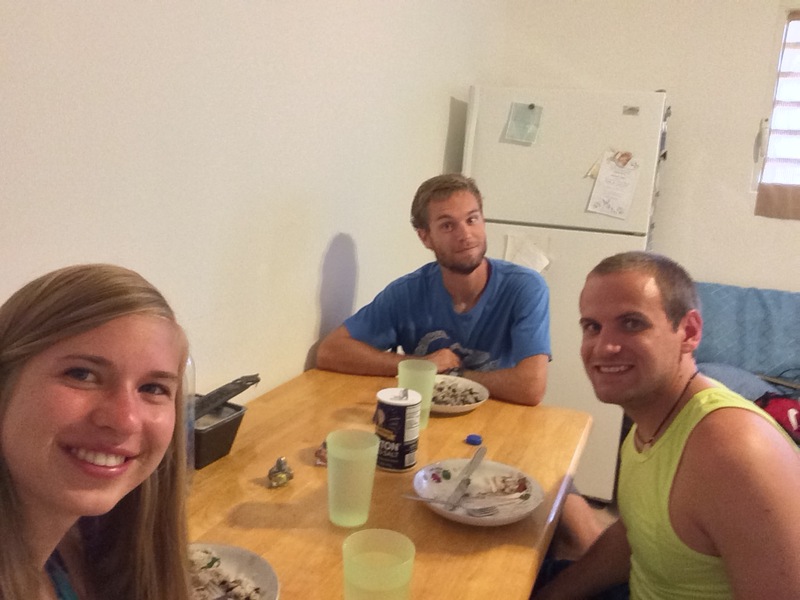 At 8:15, I met a couple friends– other spouses– near AUC and went on a 3-mile run with them. The air is humid and warm, so two of us decided to walk to the beach after our run to cool off. 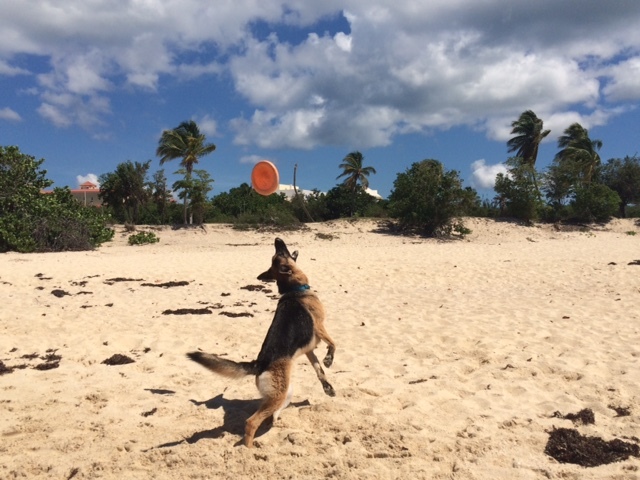 My friend brought her dog with us, and it was hilarious to watch her play in the surf! Around eleven, I went home and made lunch. I try to have it ready for Ben when he walks in the door. Today we had leftovers from a school-catered lunch we had on Monday. After eating, the two of us spent a little time together. 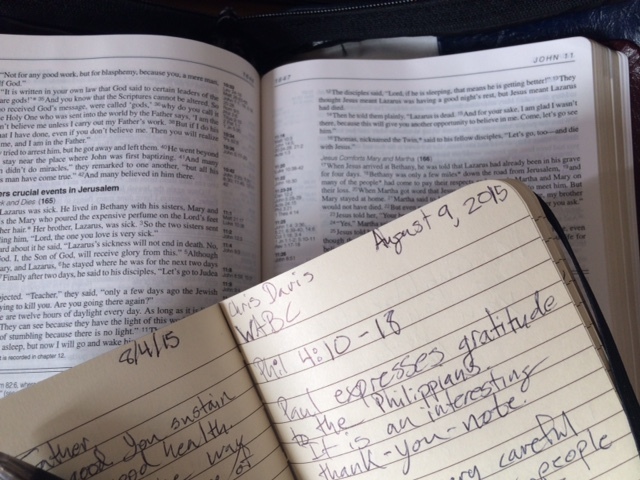 Then Ben studied his vital signs checklist while I cleaned up after lunch, blogged, and read my Bible. At two, a friend picked me up and we drove halfway across the island to the little league field. We parked behind the field next to three containers. These containers look rather unassuming from the outside, but inside, they are filled with all the wonderful things we loved in our childhoods– a labeled shell collection, a train track running along the ceiling, a remote-control robot, science projects, books, a rock tumbler, and so much more! 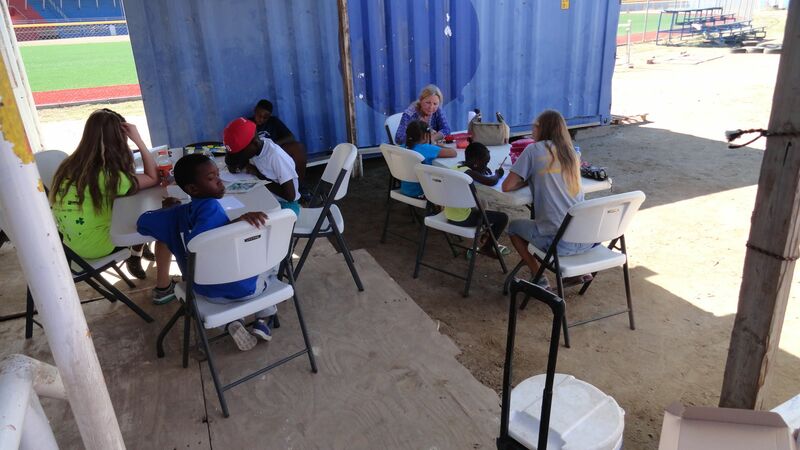 The little league coach has set up a player development and tutoring program for some of the island kids. Some of the AUC spouses come to tutor the kids and play ball with them. While we were there yesterday, I got to work on reading with a three or four kids, play catch with two little girls, and do warm-up exercises with the boys. We left around 4:30 and headed back to our homes in Cupecoy. I went shopping at the Asian market next to our complex and started a dinner of beans and rice. While everything cooked, I answered emails for my freelance art job. Want to see what I do for work? Check this out! At 6:30, Ben and his friend Matt arrived for dinner. At 7:05, I ran out the door, a little late for my Zumba class. I go to a free Zumba session twice at week at AUC’s gym. The class ended at 8:00, and I had a little time to talk with friends before going to band practice. At 9:00, I arrived at worship band practice. I’m singing and playing in our church’s worship band on Sundays– next week, I’ll be singing back-up and playing the drum. Some weeks, I’ll be helping out by playing guitar or piano as needed. Practice went late, so it was almost 10:30 before I got home. Ben and I were both exhausted! We talked for a bit, set the alarm, and fell fast asleep. Every day, Ben wakes up at 6:00 AM to study before classes. I prepare breakfast while he studies the Bible and then sets up his laptop to read about anatomy. A little after 7:00, Ben kisses me goodbye and heads to the auditorium at school to get a good seat and study more. 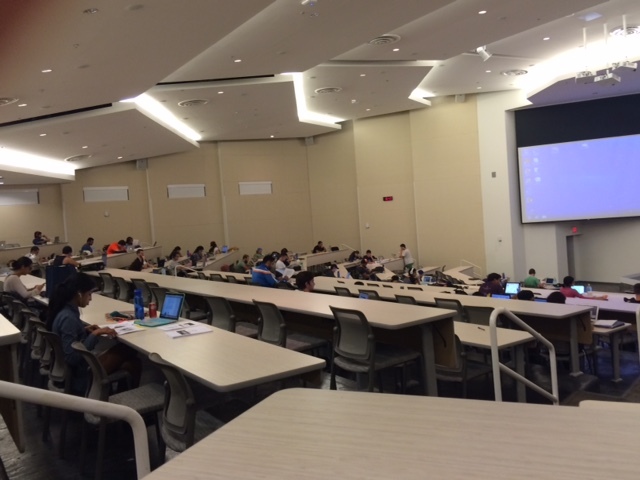 The auditorium is a silent zone when not in use for classes. At 8:00, classes begin. First is Molecular and Cellular Biology with Dr. van Oost. 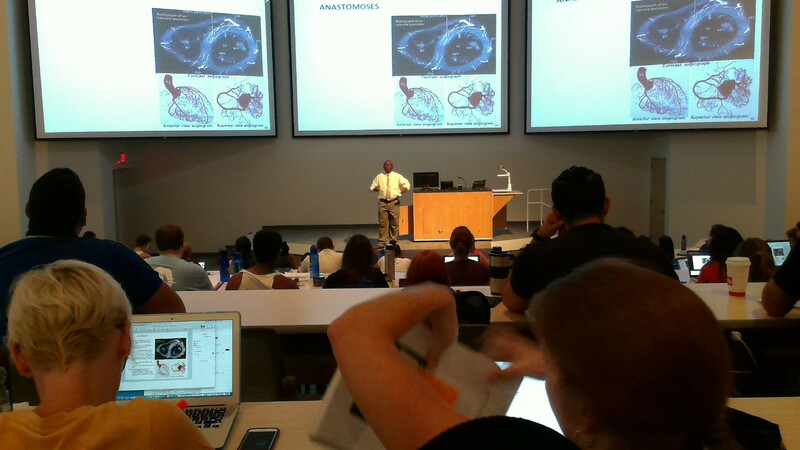 At 9:30 is Anatomy and at 10:30 Histology begins with Dr. Beveridge. At 11:20, Ben comes home for lunch. After lunch, Ben studies at home for a while and returns to school by 1:00 for lab. Lab alternates every day between wet lab and dry lab. Wet lab is cadaver lab. 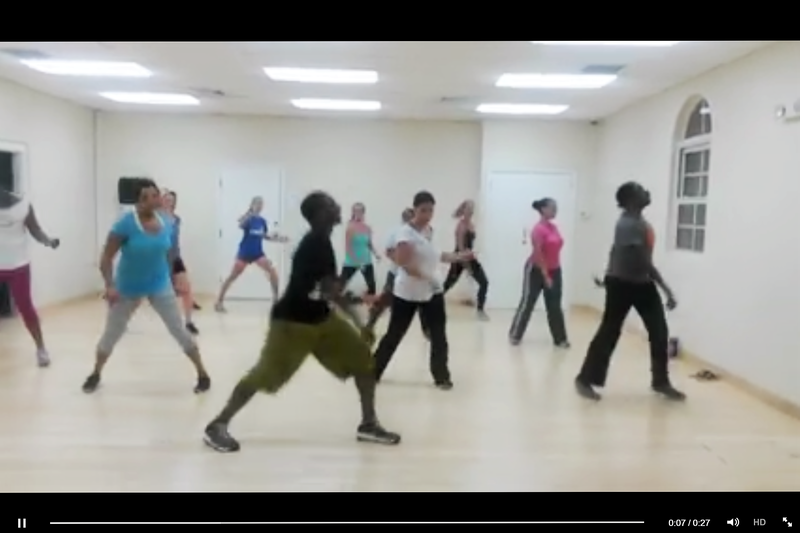 Ben is part of a group of nine students who work together on the same body all semester. There are a couple dozen different groups of students. Dry lab is in another room, where students study bones and other things that do not include body juices and formaldehyde. After lab, Ben usually stays at school to study with friends. Ben comes home around 6:00 for dinner. 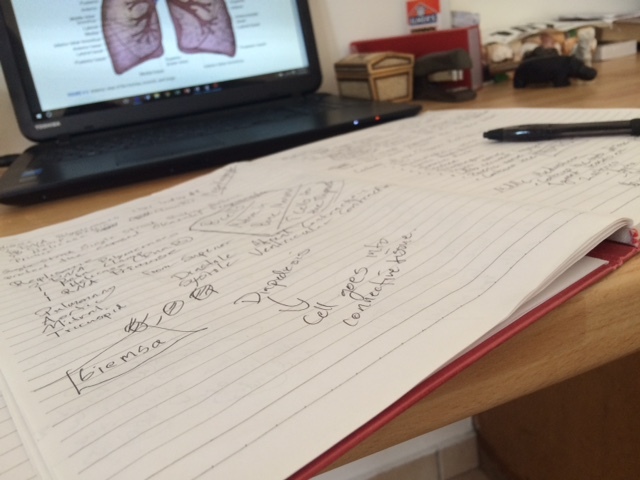 After dinner is–you guessed it!– more studying. Usually, Ben goes back to the auditorium for quiet study. 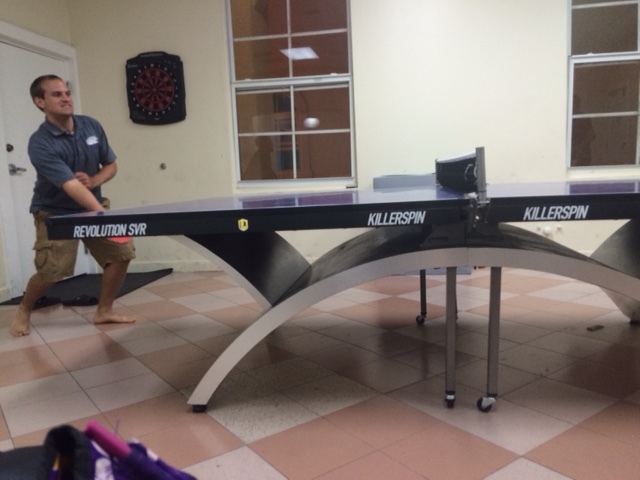 Late in the evening, after a loud and exciting game of ping-pong, Ben comes home again. We have a little time to talk and then we do devotions together–worship songs, prayer, and reading a Christian marriage book. Ben does the last of his studying and then turns of the light around 10:30 or 11:00. 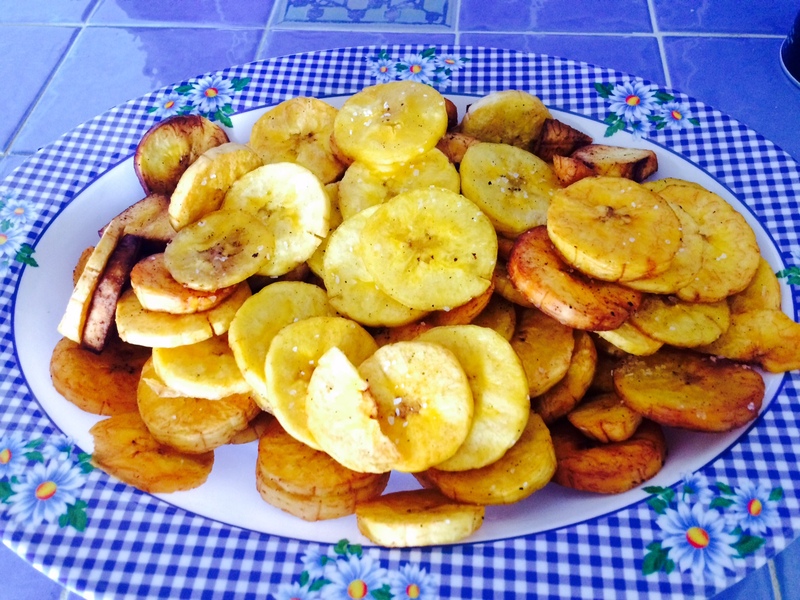 Start with a nice bunch of plantains. Don’t try to substitute them with bananas. Fried bananas will turn out sweet, sticky, but while still delicious, that’s not what we’re going for here. Before you begin, heat an 1-2 inches of oil in a pot over the stove on med-high heat. 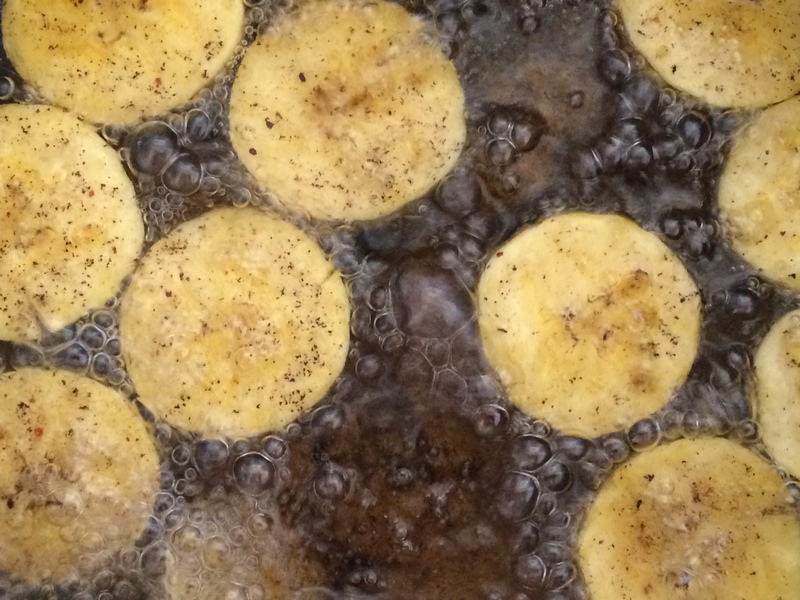 The oil is right when you drop a slice of plantain in and it bubbles and quickly floats to the top. 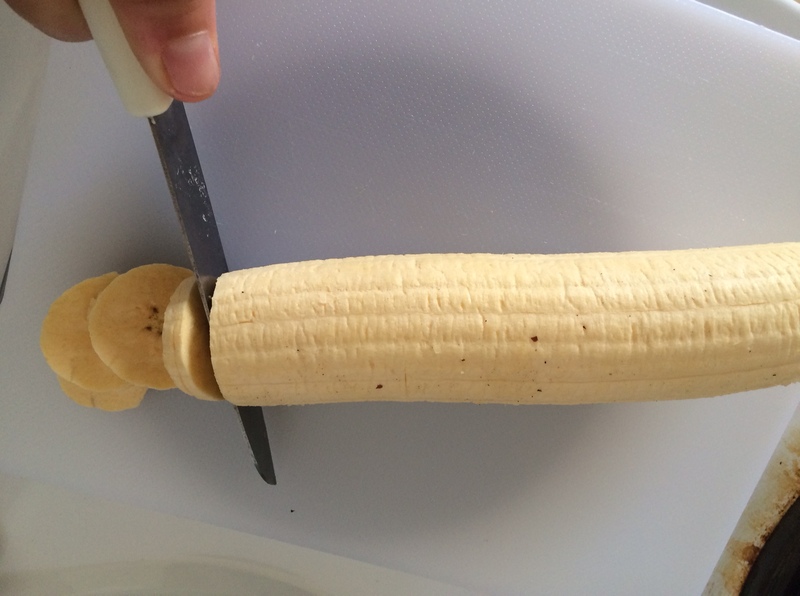 Peel and cut your plantains. Make sure your slices are nice and thin. 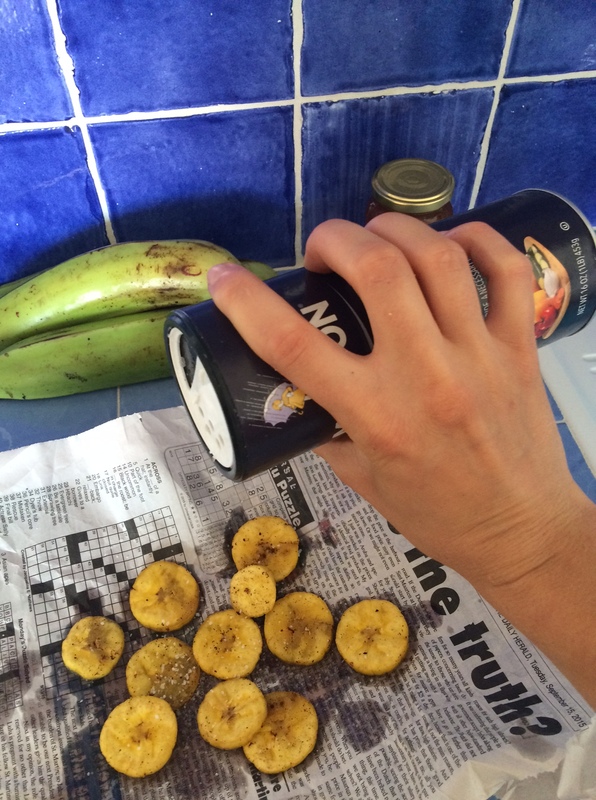 Drop plantain slices carefully into the oil. 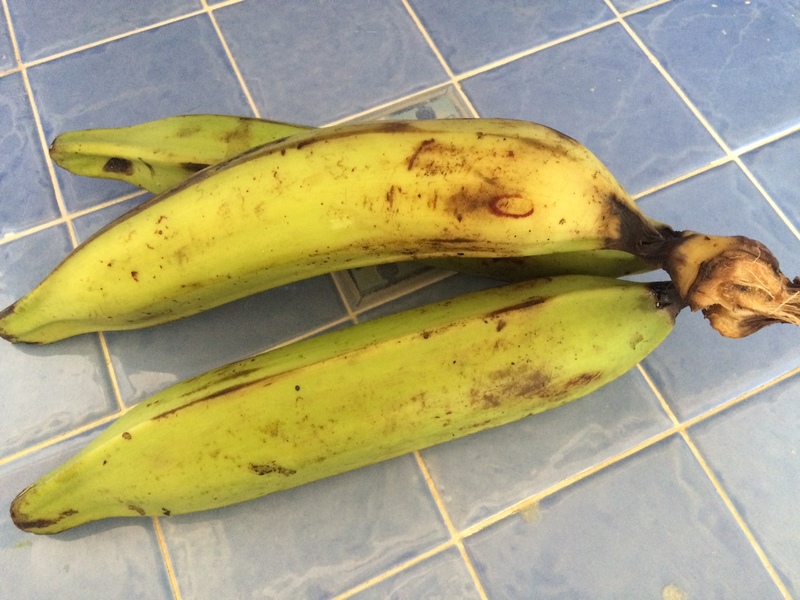 Allow the plantain to cook for a few minutes. It is ready to come out if the slices are hard and crispy, with a golden-brown hue. Drain the slices on paper towels or newspaper. I’m a little disappointed that I only had this sheet of newspaper, because I really wanted to do that crossword puzzle later! Sprinkle salt on the slices. You can also bake these! I’ll probably opt for this next time, because it’s so much healthier. Click here to find out how! Here’s a special post written by my husband, Ben. This is his story. A single set of car headlights could be seen bobbing up and down on a remote dirt road at midnight. Our jeep jolted over every bump as it raced through the night. 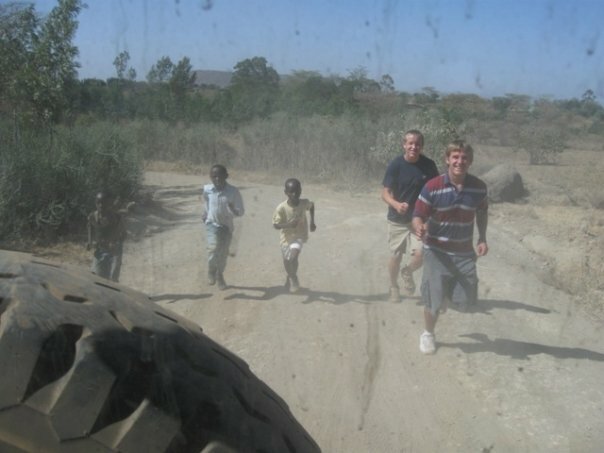 My parents were driving me to Heri Adventist Hospital in remote Tanzania. I had appendicitis and needed immediate attention. My only hope was a surgeon named Dr. Alvin Rocero, the only person within hundreds of miles that could perform such a surgery. The journey was not a comfortable one, and each bump caused a sharp pain in my lower abdomen. After several hours, we arrived and Dr. Rocero was there to meet us. We were so grateful that he and his team were willing to receive us so late at night. The staff performed the necessary blood tests and confirmed that I had an elevated white blood cell count. I remember being wheeled into the operating room and after the anesthetic, blackness. I awoke the next morning, blurry eyed and confused, but grateful to be alive. The appendectomy had been successful. 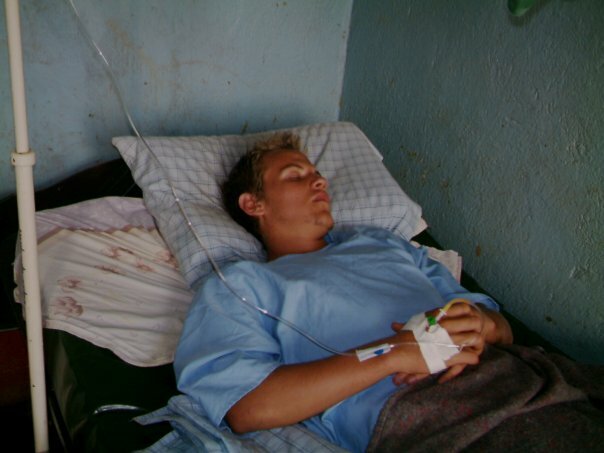 A four inch incision, complete with stitches, marked the lower right side of my abdomen, since the materials for a laparoscopic appendectomy were not available in rural Tanzania. As I lay there in the hospital, I watched the medical staff come and go. I saw the incredible needs that they met with limited personnel and equipment. I saw the love with which they served people they did not even know, treating each patient with the utmost care. 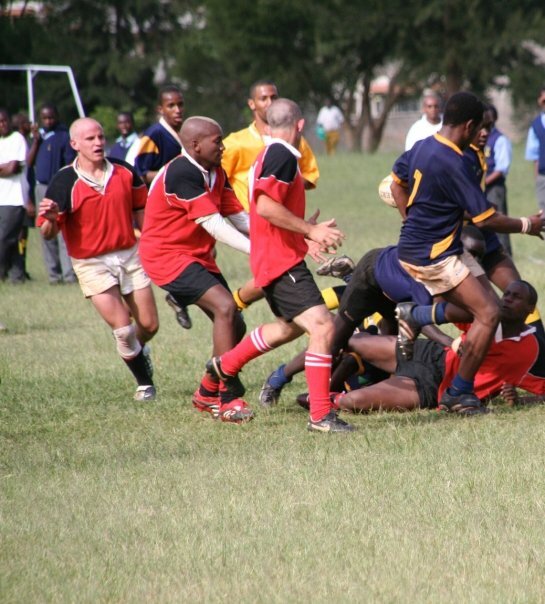 Five months later, I injured my knee while playing rugby at my boarding school in Kijabe, Kenya. I underwent a successful arthroscopic surgery at Kijabe Mission Hospital. Unfortunately, thirty minutes after the operation, I began to get a severe headache. The pain escalated until it was unbearable. I do not remember what happened after that, but the hospital staff said that my fever spiked and I slipped into a coma. My condition worsened by the minute, and the doctors thought that I was going to die. They called my parents, telling them to get on the next flight from Tanzania to Kenya because they did not think that I was going to survive. However, they performed a spinal tap and discovered that my cerebral spinal fluid was a milky color. Doctor Myrick immediately suspected meningitis and started me on intravenous antibiotics. His quick decision saved my life. Thirty minutes after they administered the antibiotics, I snapped out of the coma and began to recover. In the span of six months, I had endured much pain and suffering and almost died twice. It had not only affected me physically, but also mentally and emotionally. I realized how fragile life is and how quickly it can be lost. As I recovered in those mission hospitals, I had ample time to reflect on this and to observe the personnel who worked there. They had not only administered to me with loving care but also to everyone else. These people dealt with stressful situations every day. They were either paid too little or not at all. Many of them had sacrificed lucrative practices in the United States to come and voluntarily serve thousands of medically underprivileged people. Yet, they treated each patient with the dignity and respect that every human life deserves. Just because the services were free or at expense costs did not mean that they did the bare minimum. These people went above and beyond. They saw me. Not just whether I needed another antibiotic injection, or an IV bag, but they saw the trauma that I had gone through. They took compassion on me. They would talk to me to make sure that I was doing OK. They noticed when I was confused about something and clarified it until I understood. They exhibited the often-forgotten part of caring for people—to actually care about them. Many medical professionals can easily give a good first impression based on their physical appearance. However, all of that can be quickly forgotten if they are aloof, uncaring, and insensitive. People want to know that doctors care. They want to see it in tangible ways. It is a life-long journey of learning how to become a more compassionate and caring healthcare provider. I believe that is what separates the great doctors from the mediocre doctors. Living through these experiences inspired me to become a doctor, a compassionate and caring doctor. I want to be a physician who can care for physical ailments and conditions, but also someone who can empathize with the hurt, the confusion, the pain, the stress, the unknown, the chaos, the unfair, and the loss that patients in hospitals experience every single day. There will be many tough cases that I will face daily. There will be many demands that are placed on me. People will be difficult. Patients will be ungrateful. Technology will become frustrating. Co-workers will not cooperate. Even though all of these things will happen, I will choose every single day to see the needs of people, not just their physical needs, but their emotional and spiritual needs as well. I want to comfort the person who is crying, to acknowledge the one who feels lonely, and to clarify when I see confusion in someone’s eyes. I want to be there when someone’s world is falling apart. Being a compassionate and caring doctor is a lifelong process. It is part of being a true professional; a professional who cares. 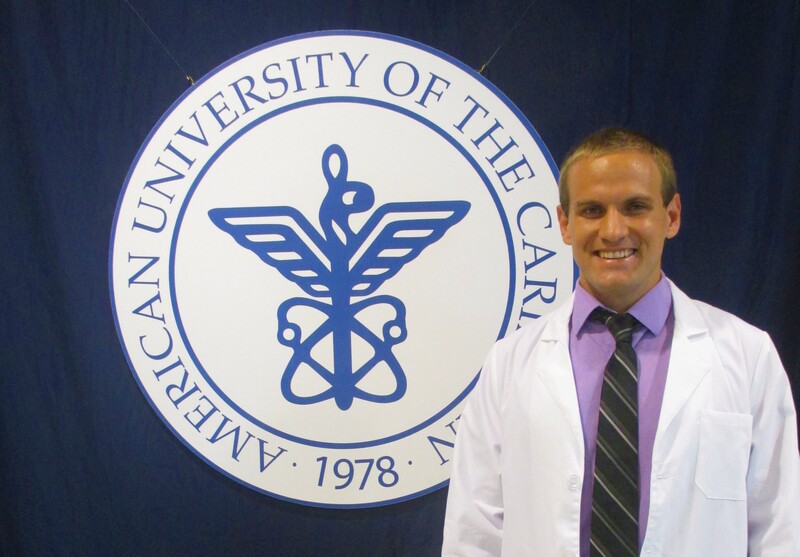 For a medical student, college graduation is just one ceremony in a series of celebrations. 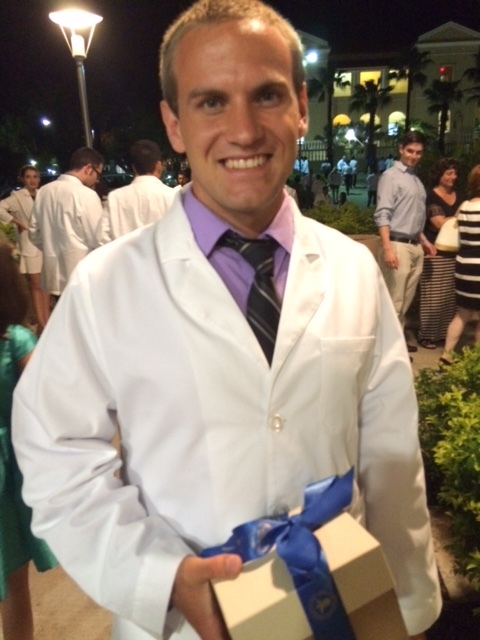 One of the most memorable events for a doctor-hopeful is the white coat ceremony. At this ceremony, the brand-new, straight-from-the box medical school student takes the Hippocratic Oath and his or her white coat. I will respect the hard-won scientific gains of those physicians in whose steps I walk, and gladly share such knowledge as is mine with those who are to follow. I will apply, for the benefit of the sick, all measures which are required, avoiding those twin traps of overtreatment and therapeutic nihilism. I will remember that there is art to medicine as well as science, and that warmth, sympathy, and understanding may outweigh the surgeon’s knife or the chemist’s drug. I will not be ashamed to say “I know not,” nor will I fail to call in my colleagues when the skills of another are needed for a patient’s recovery. I will respect the privacy of my patients, for their problems are not disclosed to me that the world may know. Most especially must I tread with care in matters of life and death. If it is given me to save a life, all thanks. But it may also be within my power to take a life; this awesome responsibility must be faced with great humbleness and awareness of my own frailty. Above all, I must not play at God. I will remember that I do not treat a fever chart, a cancerous growth, but a sick human being, whose illness may affect the person’s family and economic stability. My responsibility includes these related problems, if I am to care adequately for the sick. I will prevent disease whenever I can, for prevention is preferable to cure. I will remember that I remain a member of society, with special obligations to all my fellow human beings, those sound of mind and body as well as the infirm. If I do not violate this oath, may I enjoy life and art, respected while I live and remembered with affection thereafter. May I always act so as to preserve the finest traditions of my calling and may I long experience the joy of healing those who seek my help. The Oath has been used for many centuries and in many places around the world. 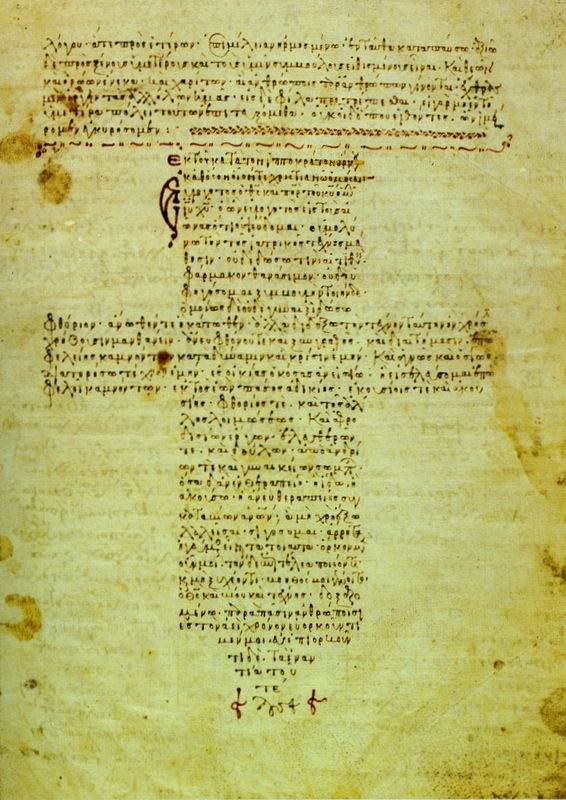 It originated in ancient Greece and was named after Hippocrates. 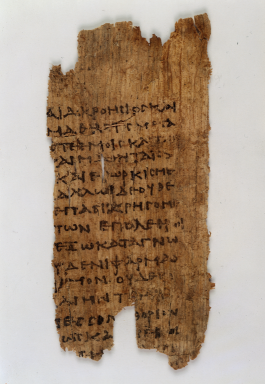 You can read the original version of the Oath here if you are interested. 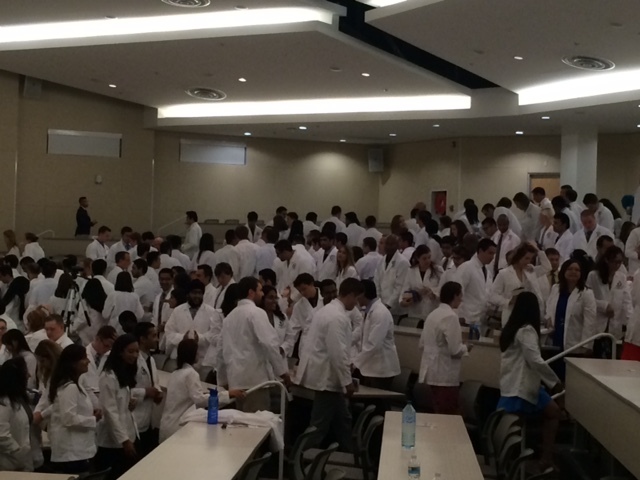 Every incoming student at American University of the Caribbean participates in the white coat ceremony. New classes enter the school each trimester. Ben’s class has about 250 students. 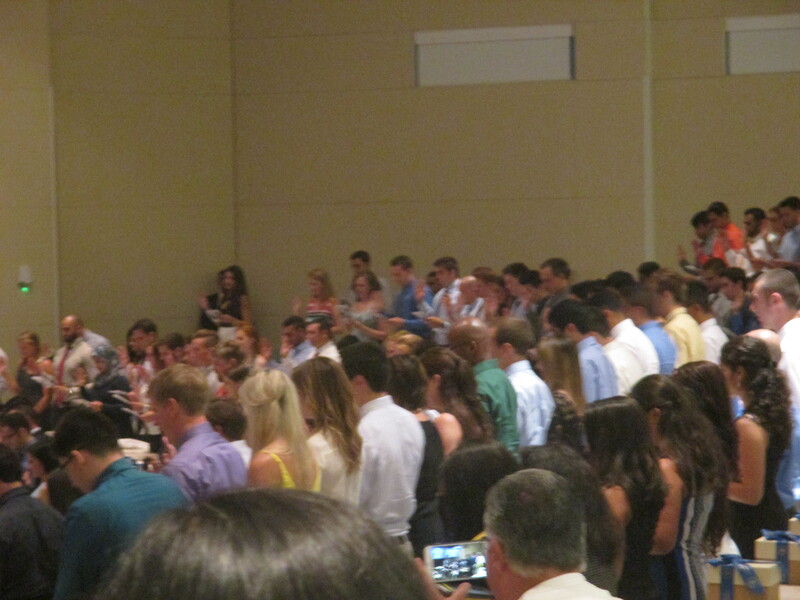 After a welcome address from the president of the student government association, the introduction of faculty and staff, a few award presentations, the introduction of the honor society, and keynote address, the students stood to take their pledge. 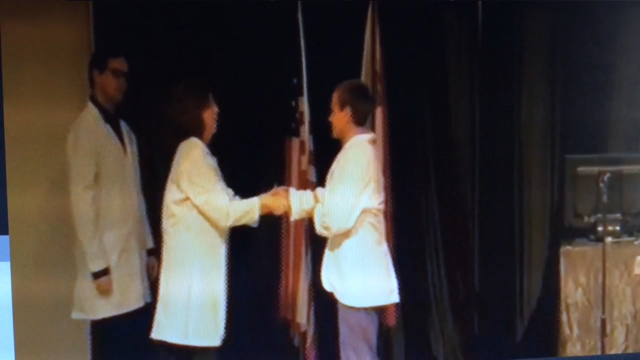 After the pledge, each student was called up to the stage, one by one, to receive his or her white coat and shake hands with the M.D. Chair and Assistant M.D. Chair. You may notice from the photo that Ben’s coat is much shorter than Dr. McCarty’s coat. 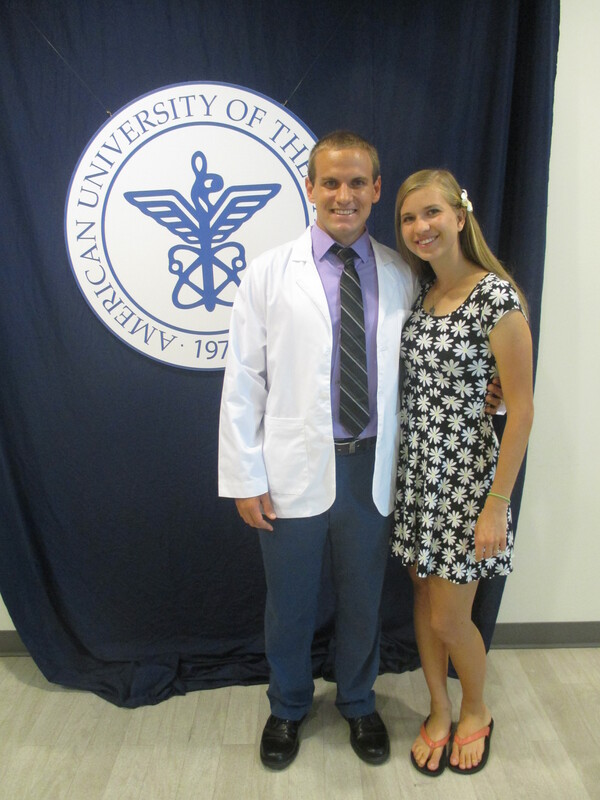 The student coat is, in fact, called the “short white coat.” Traditionally, medical students wear a short coat until they earn the title of Doctor. 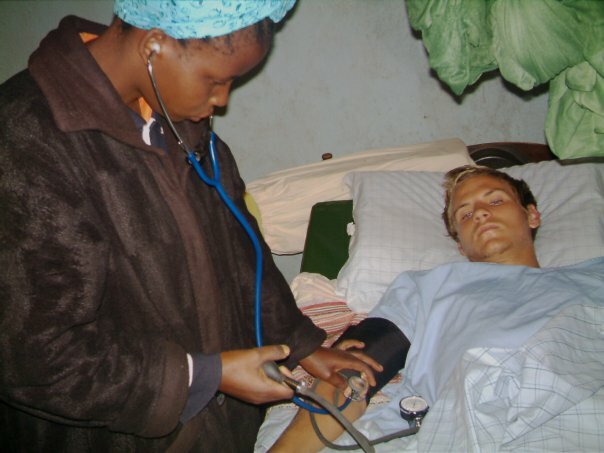 During medical school, Ben will wear his coat daily during lab period, when learning how to interact in a clinical setting, and when doing medical service in the community with the school. After the ceremony, we were all shuttled to a classy catered dinner at Puerto Cupecoy, a shopping/dining area at the edge of Simpson Bay Lagoon. 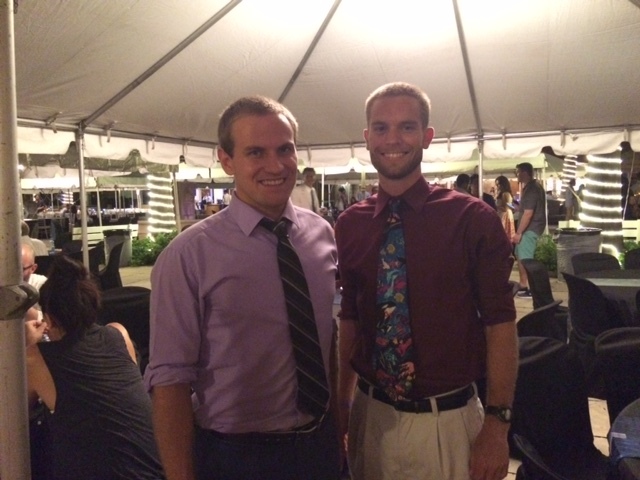 Ben and his friend Matt at the celebration dinner after the ceremony. Please appreciate Matt’s tie. I’m so proud of Ben! This is a big step. The next milestone is far down the road, and it’s time to work hard and study. As many of you know, I am currently living in a Dutch island in the Caribbean called Sint Maarten. 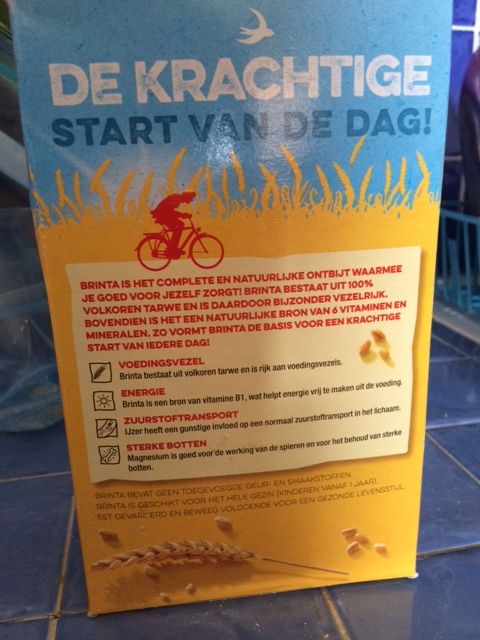 Some of you may be geographically befuddled about what exactly “Dutch” means and what country my island belongs to. Never fear, you’re not alone. Actually, until I watched this video about a year ago, I had no idea that Holland is not actually a country. If you don’t know the relationship between Sint Maarten, Saint Marten, Saint-Marten, the Netherlands, and Holland, this entertaining video will clear things up! Have fun. Liked that one? Here are a few more to widen your understanding of the world. The Cyberpeople are busy this week. My Facebook news feed is filled with causes, political arguments, moral statements, issue positions, photos of suffering people, cries for help, and hashtags for this cause or that. We live in an age where news and opinions are available at our fingertips in two seconds. The online world is saturated with activism and issues. I’ve noticed that the real-life world around me is oddly silent on the problem of dead Syrian babies, dead unborn babies, dead officers, and dead African-Americans. There are a few things that I find disturbing about this. First, I find the Facebook world irrationally dichotomistic on many issues. For example, in the matter of the shootings of African-Americans and police officers. I see some people posting a lot of #blacklivesmatter, and other people posting a lot of #policelivesmatter. Don’t both police lives and black lives matter? Can’t I care about both police officers and black people? Do I have to pick? I think that the heart behind these posts are good. People want to show their care for a group of people that are hurting. But in my view, making a case for it seems to indicate that there is a legitimate position stating that black lives or police lives don’t matter, and clearly this is not the case! In reality, do these “sides” really exist? I would imagine that there are very few people who are happy when an either African-American or a police officer dies. I think the real line is drawn between the psychos who maliciously shoot people and the people who want to live in a safe, fair society. In my opinion, the problem of a false division (and possibly the violence itself?) among people groups is perpetuated by attention in the media– the professional kind and the social kind. Black lives matter. Police lives matter. White lives matter, Asian lives matter, Hispanic lives matter, librarian lives matter, accountant lives matter, teacher lives matter. Because human lives matter. So let’s live our daily lives like we believe that–let’s stop posting our hashtags and go be nice to some people today. The second thing that disturbs me about the social media saturation of issues is that I see far more “awareness” being raised online than I see people who are actually, physically, non-virutually doing something about these issues. Friends, posting an article on Facebook doesn’t count as activism unless you are also actively involved in the cause. People are willing to post their outrage over injustice; we’re not often willing to actually take a day and do something that makes a physical impact. I know I’m guilty of this! I really hate posting my political opinions on Facebook, because it reminds me that I’m not actually doing anything active like calling senators or circulating petitions or volunteering. I don’t feel like I need to share my opinions with 921 people (minus whoever unfriends me after reading this post) who don’t care. I don’t say this to condemn those who are politically active online. Many of you have a platform to post political items; I don’t. There are enough people posting my same ideas about government. If I want to make a difference, I need to get out there and do something with my voice and with my hands. The same goes for the ten thousand causes I see floating around cyberspace. I don’t care if your favorite cause is homeless puppies or defeating Isis. If all you do is Instagram a clever meme, you’re not doing anything to further your cause. Those kids in Uganda are still going to be hungry whether or not you post a picture of a kid with big brown eyes and a distended belly. If you want to make a difference, go make a donation to World Vision. Or go volunteer with the Peace Corps. 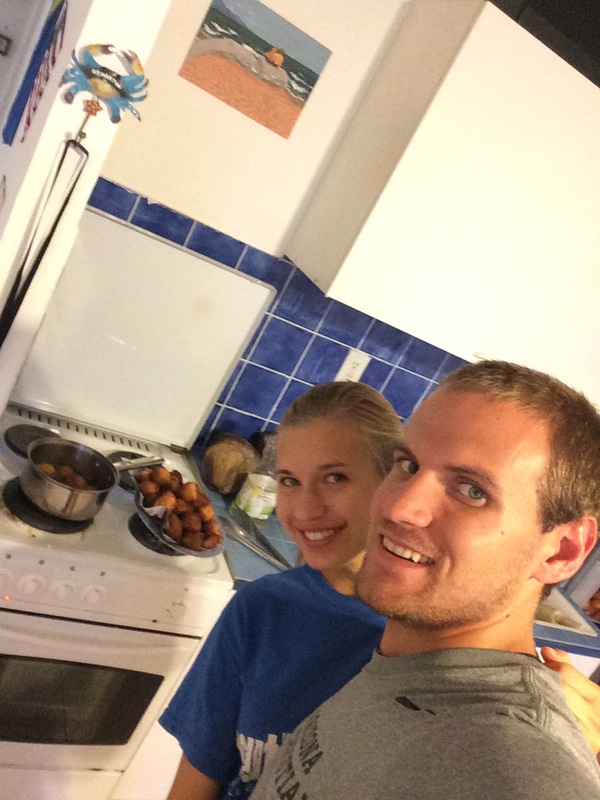 Or sell your house,move to Uganda, learn Lugandan, and train young mothers how to cook nutritious food. Then, once you’ve done something real, then post that picture, along with a link to your organization so others to get involved, too. Here’s the million dollar question: Do I care, or do I just want to look like I care? Ask yourself that. Be honest. Here’s my challenge, to me and to you. Log off your computer and close down your apps. Go do something this weekend that makes a real difference. Be a real activist. And then blog about your experience– not so you can look good, but so other people can be inspired and do the same thing. Dear American Tourists, please stop being so rude. It is no secret that American tourists do not have the best international reputation. I am an American. I live on a Dutch island in the Caribbean, where my husband goes to medical school. We were asked during orientation to be courteous and not perpetuate the poor reputation American tourists have. I do not think of myself as a rude person. I think most Americans do not. I have noticed, however, that in every country I have ever visited, “the locals are so friendly.” Maybe I have only traveled to friendly places. Maybe not. Maybe, everywhere else seems so friendly because America is generally not very friendly at all. So what is our problem? Why don’t people like us, and what can we do to change that? I would say that many things are cultural. People have different ideas of how to greet one another (one friend here said that he was sternly corrected for saying “hello” rather than “good morning,” which is proper here). People have different standards of eye contact. People have different rules for tipping, eating, asking for directions, etc etc. There are some things that you can control when it comes to cultural courtesy. You can Google whether tips are expected or insulting in a certain area of the world. You can ask what a proper greeting entails. You can watch to see whether greeting strangers as you pass is considered kind or creepy. There are also some things that you cannot control. You will not pick up on the majority of cultural nuances. You will trespass because you are used to signs designating private property. You will shake hands “wrong.” It happens. People probably won’t care too much; they will hear your accent and realize you are foreign. They will probably ignore it or laugh a little. They might become annoyed, but, hey, you’re learning. Finally, there are things that are very rude no matter where you are. Dear American tourists, please do not do these things. Please do not act as if you are better than other people. Your taxi driver and your waiter are not there for you to unload your grouchy jet-lagged crabfest upon. And just because people do things differently than you would does not mean it is “wrong.” It’s just, well, different. Please do not act as though America is superior to all other nations. We Americans all love the stars and stripes, and that’s a good thing! However, people don’t want to hear a string of comparisons that belittle their own beloved nation. America is a culture where things are dichotomistic, time-oriented, and efficient. Most places aren’t like that. So don’t freak out when things are relaxed, confusing to you, or just plain irritating. If you wanted things to be American, you would have stayed in America. So enjoy the culture, embrace it while you’re there, and look for the good aspects. 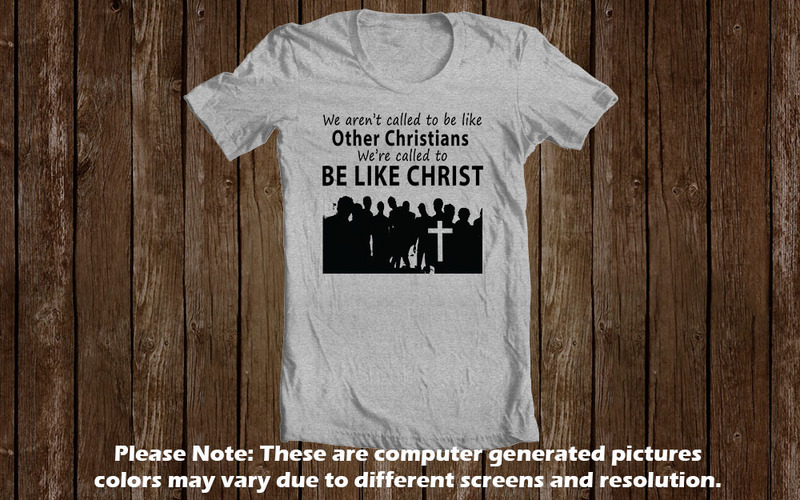 Please do not be ethnocentric. No matter where you come from, it’s easy to place anyone different from yourself in the category of “Other.” You know what I mean, those Other people. The ones who look or dress or work or speak differently. I think that if we aren’t careful, we often look at people who are different from ourselves as less intelligent, less skilled, less important. You see a woman in a third-world county who is illiterate and does not work outside the home, and has never touched a computer. You may have more education and technical skills, but can you keep eight kids clothed, fed, and healthy in a two-room mudbrick home with no electricity, no water, and no stove? Can you sort rice so that not one tiny stone ends up in the pot? Can you carry 50 pounds of stuff on your head with no hands? Do you speak three languages? Can you keep a garden that supplies most if not all vegetable needs for your family, plus provides a little income? That, my friends, takes some serious skill. Some things are easy to miss. Learn to appreciate them. And just simply LEARN! Don’t go somewhere expecting to be a guru of all knowledge. (Shout out to short-term missions trip people here.) If you want to teach, you must first be a student. You will get more respect if you are willing to ask to be taught. Plus, it’s fun. It’s an icebreaker. It brings much laughter. Please do not devalue other nations’ autonomy. I cringed when I heard an American tourist say, “The Bahamas should just be another state. It’s basically just part of the U.S. anyway.” How uninformed. Please, Mr. Florida Guy. You visit Touristville where half the people are white and everyone speaks English, and suddenly you think you know everything about the nation! My advice is, forget the tourist traps and take a local taxi or bus to the places that the locals hang out. Then you can get a feel for how people live. Learn about their government and read about the very intelligent people who run the state. There’s so much more to a place than just its American-catering tourist industry. Please do not offend the locals by the way you dress. There are places where a bikini is pretty standard. There are places where you really ought to cover up, even arms and legs. Know the difference. There is no reason to exercise your liberty to dress revealingly if it gives you, your organization, and your country a bad name. Please be mindful when you take photos. In some places, you can get your camera confiscated if you take a photo of the wrong thing (military or police in some countries). In others, people simply don’t want to be in your scrapbook. In general, don’t objectify locals as if they were some interesting foreign specimen. Please do not be pushy. Yes, you come from a place where you can get pretty much whatever you want almost as fast as you want it. When traveling abroad, be mindful that this is rarely the case. Do not intimidate, complain, or demand. Rather, be smart and be respectful. Please just be kind and courteous. In the end, people know you’re a visitor. They expect you to be, well, a weirdo. However, it is possible to be a courteous weirdo. Say please and thank you, smile, treat people the way you would like to be treated. Kindness counts, and it can go a long way in improving our international reputation.